Yossef Bodansky is an Israeli-American political scientist who served as Director of the Congressional Task Force on Terrorism and Unconventional Warfare of the US House of Representatives from 1988 to 2004. He is also Director of Research of the International Strategic Studies Association and has been a visiting scholar at Johns Hopkins University's Paul H. Nitze School of Advanced International Studies (SAIS). In the 1980s, he served as a senior consultant for the Department of Defense and the Department of State. He is also a senior editor for the Defense and Foreign Affairs group of publications and a contributor to the International Military and Defense Encyclopedia and is on the Advisory Council of The Intelligence Summit. 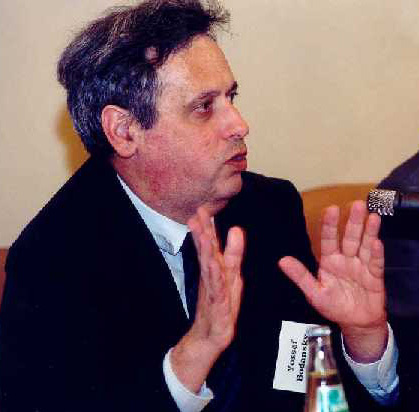 In addition, Bodansky was a visiting scholar in the Security Studies Program of John Hopkins University and served as consultant to the U.S Departments of Defense and State prior to assuming his current post. Bodansky is a recognized authority on terrorism worldwide, as well as an expert on guerilla and unconventional warfare and all aspects of the military affairs of Russia/The Soviet Union and the Third World. Yossef Bodansky is a Special Consultant on International Terrorism for the Freeman Center For Strategic Studies. "An amazing account of history an how we what we can learn from the War on Terror."